A gentle hand and body wash made from moisturising and nourishing ingredients, hand blended with uplifting and revitalising lemon myrtle and cedarwood essential oils. 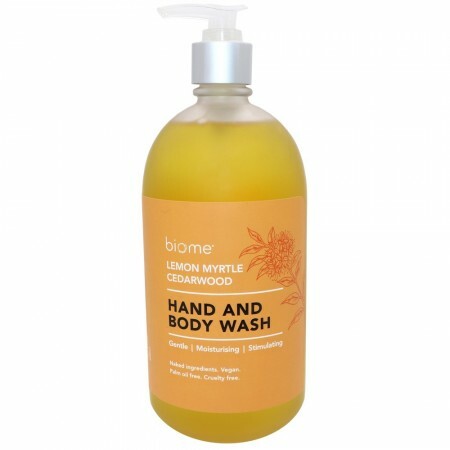 Palm oil free, vegan and cruelty free, this all-over wash is suitable for all skin types and great for all ages. 500ml. No additives, no preservatives, no synthetic fragrance. Beautiful and pleasant scent for everyone. Stimulating essential oils of lemon myrtle and cedarwood. Effective cleanser that lathers well. Gentle formula suitable for sensitive skin. Saponified Olive Oil, Castor Oil* and Coconut oil, Essential Oil (Lemon Myrtle and Cedarwood). *Organic. Store in a cool place away from sunlight. Use with 12 months. 500ml. Packaged in a frosted glass pump bottle suitable to recycling or reuse.